We all love Mondays, right? 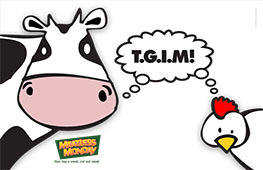 Well now there is another reason...TGIM, its Meatless Monday! There is a movement across the nation, well actually across the planet, to reduce meat consumption by 15% with the aim of improving our health and the health of the environment. I just learned about this recently, but judging by the amount of blogs, articles and company pledges that exist out there on the subject, I'm late to the party. Click here to read the full article, but in a vegetarian nutshell, here are a few of the benefits of going meatless. For your health: reduce heart disease, limit cancer risk, fight diabetes, curb obesity, live longer, and improve your diet. For your wallet: cut weekly budget, and curb healthcare spending. For our planet: reduce carbon footprint, minimize water usage and reduce fuel dependence. And why on Mondays? Apparently Monday is the day to sustain positive change. We get serious again after a weekend of letting loose and we go back to structure, and settle into our routines. Studies have shown that we are more likely to retain behaviors that are begun on Mondays. I discovered that there is a whole host of Monday campaigns, but that's a whole other kettle of fish...umm, I mean beans. In honor of my first (official) Meatless Monday, here is my vegetarian chili. I like to start with whatever veggies I have in the fridge. In this case, carrots, celery and onions. My secret trick is to use red lentils. They thicken the sauce, and because they are the same color as the tomato base, you can barely see them. This comes in handy for picky children/boyfriends/co-workers who aren't enthusiastic about eating lentils. I also add corn and black beans. I prefer using black beans or chick peas in my chili as opposed to the traditional kidney beans. I'm not sure why, but somehow they seem more flavorful and unique. Add a can of diced tomatoes, and let the whole thing simmer until the lentils and veggies are soft. Its best topped with a little grated cheddar cheese. After all, its Meatless Monday, not dairy-free Monday. I love the idea of using red lentils! Looks absolutely delicious! !